It should come as no surprise that Earth Day is my favorite holiday. These last couple of years I seem to be working on an Earth Day tradition: exploring New Mexico’s bizarre and beautiful rocks! Last year, I took a friend to Tent Rocks and this year, I spent the afternoon in the Garden of the Gods. Knowing the nature of New Mexico’s wild rocks – Tea Kettle Rock, the Ojito Wilderness, Tres Piedras, to name just three – I could probably keep up with this theme for many years to come! The name Garden of the Gods is not hyperbole. This place is a geologic wonder. Massive 40-foot high fins of Dakota Sandstone rise up from the crust, trending north-south. These thick slabs of white, yellow and pink sandstone were formed long before the dinosaurs roamed, when this region of the world was covered by an inland shallow sea. Around 27 million years ago, during the uplifting of the Sangre de Cristo mountain range, these layers were broken apart into slabs and stood vertically. 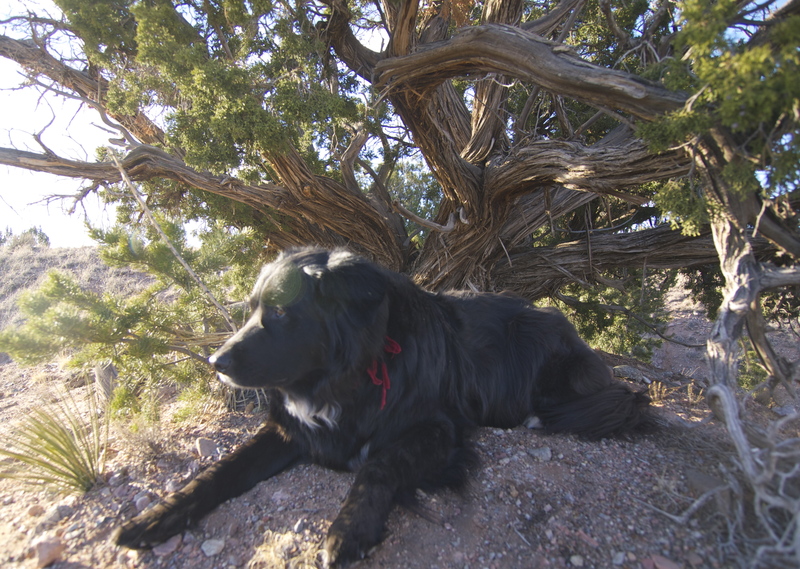 Garden of the Gods D.O.G. The fins in this big backyard are exposed sections of what’s known as the Dakota Wall formation, which runs along the eastern roots of the Rockies, surfacing at the spectacular Garden of the Gods in Colorado Springs and again, further north, at the Flatirons near Boulder, Colorado. 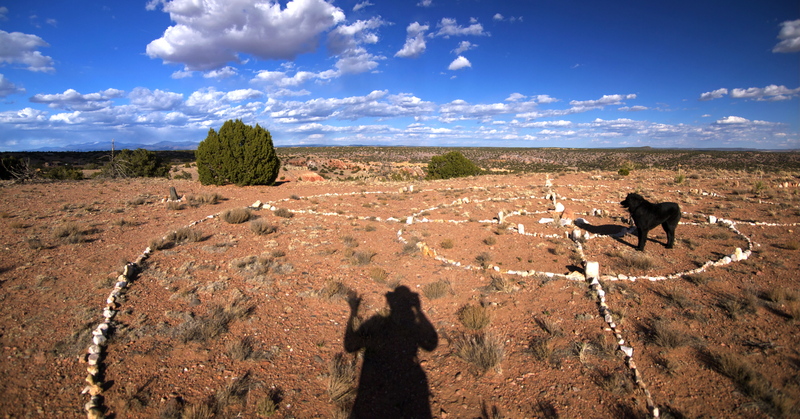 Less than a mile south of here, the Dakota Wall cuts through the water table of the Galisteo River basin. Flowing underground along the rocks, water naturally pools in the aquifer beneath the Garden of the Gods, making this place an oasis. People have been coming here for thousands of years to marvel at these rocks, seeking the miracle of water in the desert and on this day, Earth Day, I was lucky enough to find a shard of their history. 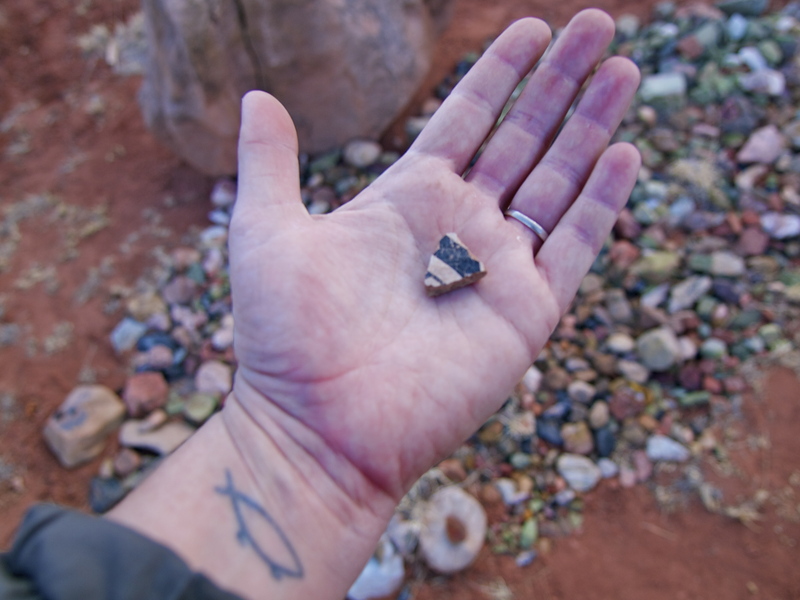 This is ancient: A shard of pottery left by the Anasazi. Garden of the Gods is geologic proof that connections on this Earth – between New Mexico and Colorado, between here and there, between then and now – run deep, occasionally surfacing where we can seem them, if we go looking. Here’s to seeing more of the world! 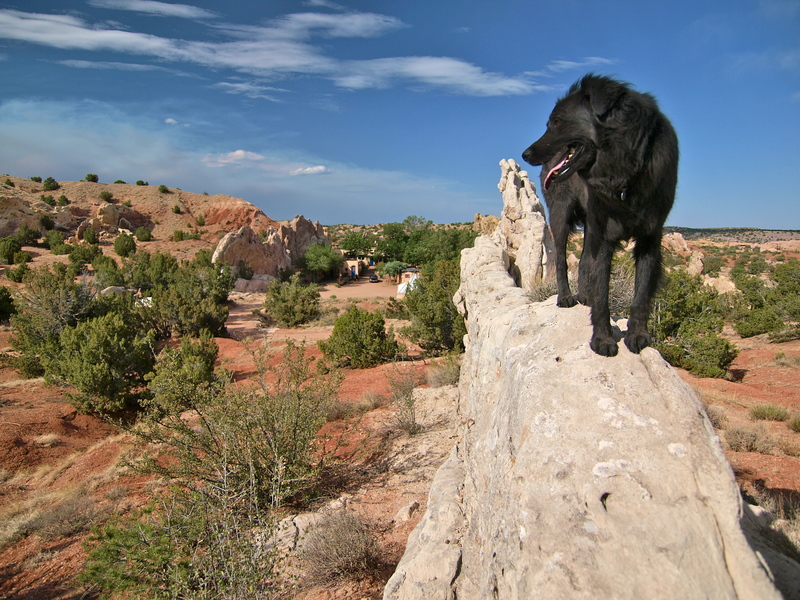 This entry was posted in Bowie & D.O.G., Hiking!, New Mexico, Photography, Uncategorized and tagged Anasazi pottery, Earth Day, Garden of the Gods. Bookmark the permalink. That 4th photo down reminds me of a Sphynx! I often stop at Garden of the Gods on my way to or from Santa Fe, since I live in the East Mountains and have to drive right by it. My sons and I have hiked up to the top ridge a few times and just sat and enjoyed the views. I just got home from a long weekend of riding at San Lorenzo Canyon, near San Acacia, NM. If you have some time, you should consider a visit. Lots of beautiful rocks and amazing geology to explore and photograph there. Here’s a link to my blog with a few of the photos that were taken this past weekend during my visit. Amazing scenery .I just love the geology of that place and would give anything for that shard of Anasazi pottery . Thanks for sharing Mary. Yes, it’s always so tempting to keep those treasures, but I’m proud to say I left it lie. 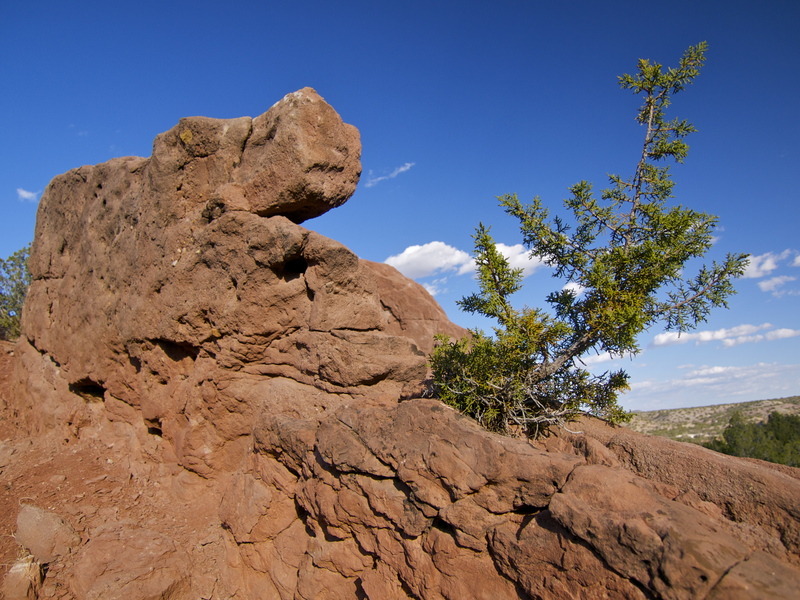 I’m with you–I love New Mexico’s weird and wonderful rocky landscapes. 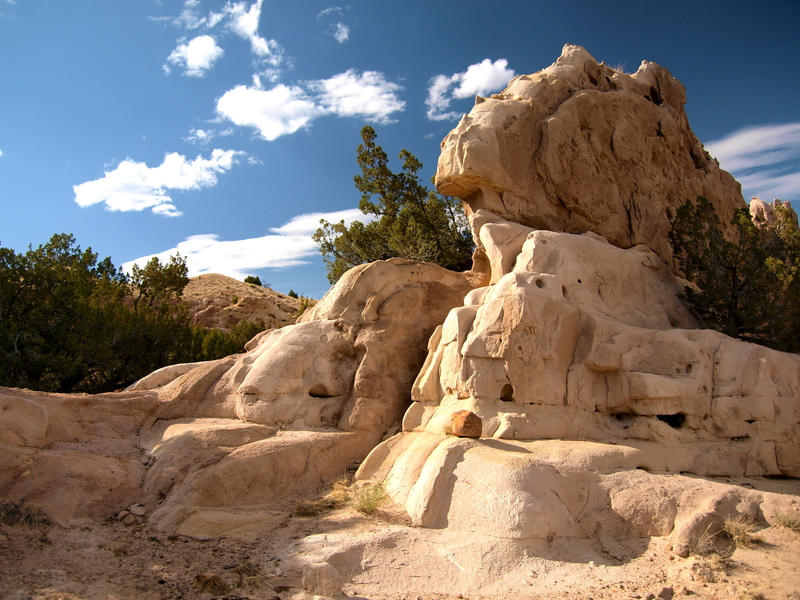 Have you been to the San Jose Badlands north of Cuba, NM? We were introduced to this marvelous place Monday on an outing with a group. Until I saw your post, I had forgotten all about the fact that Monday was Earth Day. I love following your travels. And you take such beautiful photos. Thanks for sharing. It’s very interesting about your tattoo! Could you please tell the story?